Yes, seriously! Since I started using Tailwind, Pinterest is my most important traffic source. All successful bloggers get thousands of visitors from the visual search engine every day! In this article, I want to unveil their secret of getting tons of traffic using Pinterest scheduling tools! The best thing is: Using Tailwind and Pinterest is actually fun! I love designing pins, scheduling them with Tailwind and seeing them go viral. What is Tailwind and how can it help you? 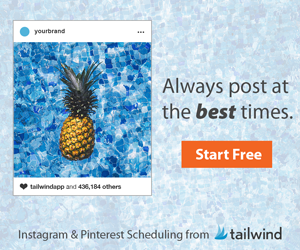 Tailwind is a smart scheduling tool for both Pinterest and Instagram. With Tailwind, you can create a personal smart schedule, select pins you want to post, and let Tailwind post them automatically at the times when your followers are most active! This automation makes your life so much easier, saves you a lot of time, and also boosts your traffic! Tailwind also offers you a variety of tools to monitor your results for both individual pins and boards. Note: Tailwind is an official Pinterest partner! Before I started using Tailwind, I spent hours and hours each day on Pinterest manually pinning my content to various boards. This was not only unbelievably annoying, it was also extremely inefficient and did not result in a lot of traffic. I almost gave up on increasing my Pinterest traffic! The turning point – How my blog took off! I cannot stress enough that starting to use a Pinterest scheduler did not only save me a huge amount of time, it also increased my traffic 10 times! I can only recommend trying it out yourself! You will be surprised by seeing the amazing results! I want to point out that this success is my personal story. As individual results may vary, you can take a look at "Typical Results of Tailwind for Pinterest Members". There, you can check out the average growth rates for Tailwind users. Try it out yourself! You can schedule up to 100 pins for free – no time limit, no credit card required! Click the image below to get started! In the following, I want to explain how to use Tailwind to make your pins go viral! Tailwind lets you create a personal smart schedule based on when your followers are most active and repin your pins! To set up a smart schedule go to publisher and click “your schedule”. You can click “generate new smart schedule“ to create a new schedule based on the number of pins you want to publish per day. With board lists, you can group multiple boards. If you blog about food, you could group all your boards about recipes into one list and simply select this list when scheduling a post. Thereby, you can post one pin to multiple boards with one click! I can definitely recommend downloading the Tailwind browser add-on. With this tool, you can directly schedule pins from any website or from Pinterest. You can see the little Tailwind icon next to the url box. Now you can go to a website or to Pinterest. Once you find a photo that you want to schedule as a pin, simply click the little “schedule button”. A new window will appear with your pin. You can do this as often as you want! Once you selected all the pins you want to pin, open Tailwind, go to “publisher” and select “drafts”. All your previously selected pins will appear here! 4. You can save multiple pins and find them under "Drafts"
You can now edit the description, select boards, and add the pins to your queue. A pin will automatically fill in the next free spot in your schedule! To mix up the pins in your queue, simply select “shuffle queue”. This way, I can schedule 700 pins per week in less than 1 hour! Isn’t that amazing? Tailwind tribes are very similar to Pinterest group boards. You can submit content to a tribe and your tribemates will repin it! Thereby, you can get thousands of views even with a small number of followers! Do you want to join my tribe on blogging tips and social media strategies? Click the button below! I hope that this article helps you to make your pins go viral! Tailwind is an incredible tool to automate your Pinterest efforts and will increase your traffic tremendously! If you have any questions about Tailwind, message me here.